If you are not confident in the kitchen, or want a taster course to see how you get on, then the best starter for you may be my 'Appetiser' course. This lesson uses the preparation and cooking of a single meal as a means to demonstrate and teach all the main elements of being a chef. You choose the ingredients to would like use, and buy them before the lesson starts. I then run through all the basic techniques of cooking with these, to show you how different types of meals can be created and developed. You even get to eat the meal at the end! And if choosing the ingredients is unfamiliar to you? Relax - I would always discuss ideas with you on the phone before the lesson starts, to make sure you feel prepared. 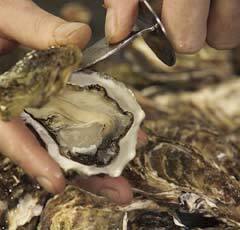 If you fancy oysters as part of your appetiser, then oyster shucking will be in your training - it all depends on what you put in your shopping basket on the day!